PRODUCT DESCRIPTION: NBS Insect Repellent is designed for use in exterior coatings like paint and stain. It will deter and inhibit insects from burrowing through or crawling on exterior coatings and is appropriate for use in residential applications as well as dairy facilities, drive-in restaurants, golf courses, parks, playgrounds, poultry houses, recreational areas, schools, landscape areas, zoos, etc. It’s also a great way to repel unwanted insect activity around the home. 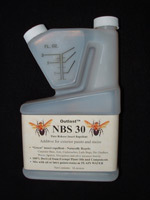 Safe to spray on plants, furniture and other objects commonly found in the yard, NBS can be used to chase away pests like wasps and bees. It won’t kill anything; NBS is just a repellent. 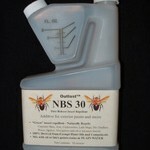 Made with nothing but plant oils found to repel insects, NBS is not a pesticide. It’s unique actives make it ideal for safe for use around children and pets. Apply it to the siding, roof tops, shrubs, plants, swingsets, lawn furniture, umbrellas and pretty much on any object you’d like to keep pest free on or around the home in the yard. TARGET PEST: Ants, Asian Ladybugs, carpenter bees, carpenter ants, cockroaches, beetles, ladybugs, mites, spiders, fleas, ticks, silverfish, dirt daubers, bees, wasps and other unwanted insects. RATE OF APPLICATION: Mix 3.2 oz per gallon of water and apply at the rate of 1 gallon per 500 sq/ft. You may also mix it with paint or stain at the same 3.2 oz per gallon. Sold it pints, one pint will make 5 gallons of finished product. When mixed with water and sprayed, treatments should last 1-2 months. Treat more if pests return sooner. When used as a paint or stain additve, applications will last 1-2 years. How do I get rid of bees on my shrubs?